That’s what Dexter Santos, the director of Ang Huling El Bimbo, promises as the musical show returns for a second run after its successful staging in September at Resort’s World Manila. “The script is updated, there are more twists to the story, and a new set of actors will surely entice the audience as they once again feature the timeless songs of Eraserheads,” Santos continued. Returning cast members are Gian Magdangal, OJ Mariano, Jon Santos, Reb Atadero, Boo Gabunada, Bibo Reyes, Tanya Manalang and Menchu Lauchengco-Yulo. Joining them are Nicco Manalo, Lance Reblando, David Ezram, Phi Palmos, Myke Solomon, Rafa Suguion-Reyna, Gabriella Pangilinan, and Carla Guevarra-Laforteza, new set of actors who went through rigorous auditions. “If you put them on stage together, they can experiment, they can also put so much on those characters. Doing it for the second time is all about possibilities, about perspectives, about choices,” Santos said. For Gian Magdangal, who retains his character Hector, the restaging of Ang Huling El Bimbo is an entirely different journey. “There are so many choices to make because we have to define what we want, what I want for my character,” Magdangal shared. 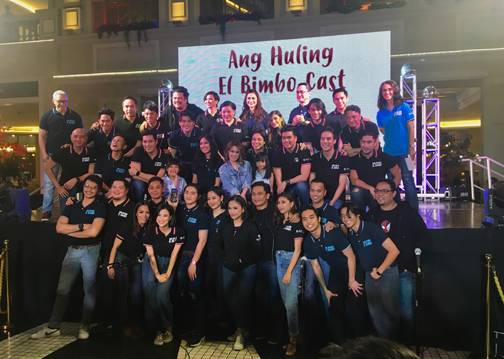 Ang Huling El Bimbo runs from March 1 to April 6. Tickets are available at Ticket World (www.ticketworld.com.ph) and at the RWM Box Office at GF Newport Mall, Resort’s World Manila.